A historic vote to bag single-use bags in L.A. is set for Friday at City Hall. 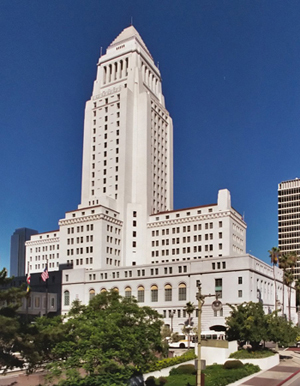 The Los Angeles City Council heard testimony from over 60 people today on the long-awaited single-use plastic bag ban. The environmental community was well represented and attired in natty green. Other supporters included reusable bag manufacturers, the California Grocers Assn., the L.A. Chamber of Commerce, and 17 neighborhood councils! Clearly, a life without single-use plastic bags is a popular movement that has grown well beyond L.A. County, Long Beach, Malibu, Santa Monica, Calabasas and other SoCal cities. Opposition was provided by bag man Stephen “This bag is more than a toy” Joseph and Crown Poly bag manufacturing staff. Joseph tried to tie the city council vote to California’s ranking by industry titans as the place they’d least likely want to do business. I’m not sure where the ranking came from, but Joseph did say that Texas was No. 1. Enough said. Thanks to a prior commitment to the environmental community from Council President Eric Garcetti, the City Council heard the testimony. However, members were uncomfortable taking action without the bag ban first going through the Energy and Environment Committee. Thank you Simon Cowell. An irate Heal the Bay member wrote a scathing e-mail encouraging us to take a stand against your ocean pollution commercial. It’s bad enough that my 12-year-old daughter Natalie is obsessed with his “American Idol” rip-off, “The X-Factor.” (Try getting her to study when she’s sucked into the battle among Kitty, Misha B and 2 Shoes.) But now he’s doing a Verizon “X-Factor” app promo that encourages the trashing of a Malibu beach. In the spot, Cowell is seen tossing cell phones off his beachside balcony onto the shoreline while disparaging them as rubbish. Cell phones contain a wide variety of toxic heavy metals, including arsenic, antimony, beryllium, cadmium, copper, lead, nickel, and zinc. They also can contain brominated flame retardants and phthalates. Perpetuating our throwaway culture to over 12 million viewers isn’t exactly helping the cause of ocean conservation. Cowell ends the spot by admonishing a family on the beach to not pick up the trash. Even the leashed puppy complies with the bombastic Brit’s orders. If Cowell gets busted for bad behavior, I hope his community service is participation in Coastal Cleanup Day for life. The Brits are always giving us trash: Gordon Ramsay, The Osbournes, the Spice Girls, Jason Statham, soccer (just kidding on that one, sort of). Now they’re trashing our beaches. Wasn’t British Petroleum’s Deepwater Horizon oil spill bad enough? Heal the Bay's Kirsten James, left, and Sarah Sikich, right, enjoy a shave ice with their fellow eco-activist Leslie Tamminen. The group participated in the just concluded International Marine Debris Conference in Hawaii. 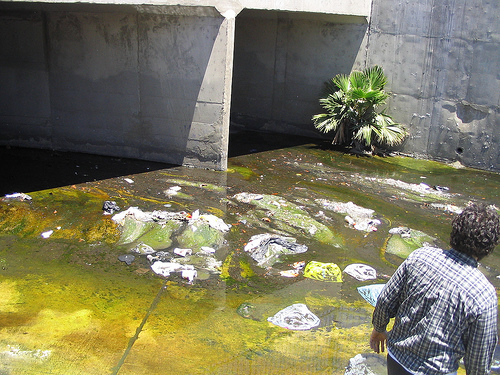 Today’s guest bloggers are Kirsten James, Heal the Bay’s Water Quality Director, and Sarah Sikich, Coastal Resources Director. Here they discuss their experience traveling to Hawaii last week and participating in the 5th International Marine Debris Conference. 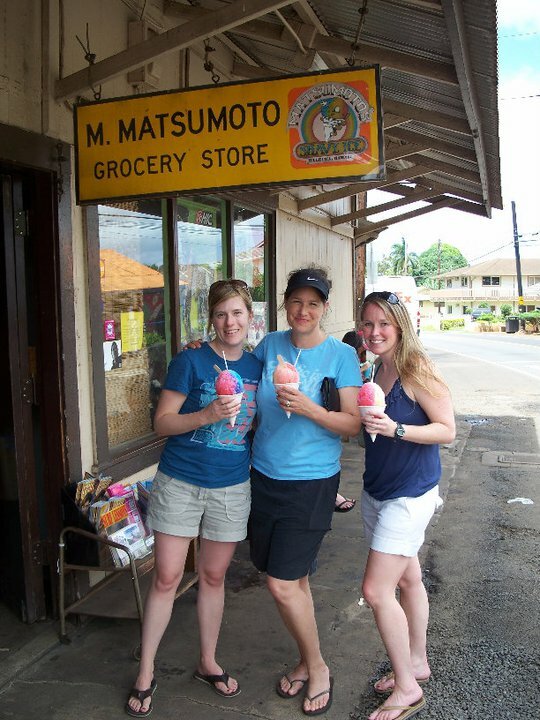 Sarah: It’s unreal – spending a week in Hawaii for work! Not to mention meeting some of the leading researchers, government agencies, environmental organizations, and explorers working on marine debris and plastic pollution issues. Was there any research presented that you found particularly memorable? Kirsten: It’s hard to pick just one presentation but one that stands out is the work being done by Dr. Jan A. van Franeker from the Netherlands. He gave several revealing talks on his research with Northern Fulmars, a marine bird species. He found that in the North Sea, the “average” Northern Fulmar flies around with 0.3 grams of plastic in the stomach, rising to 0.6 grams in more polluted areas. If you scale this bird up to the size of an average human, that would equal 30 grams of plastic, resembling a lunchbox full of plastic sheets, foams, threads and fragments! How about you, did any of the presentations stand out? Sarah: I’m glad to see how much research is being focused on endocrine disruptors and plastics. Many researchers in the field have raised concerns about whether chemicals associated with plastics are leaching into the tissues of wildlife and fish ingesting this trash. Previously little work had been done to determine whether this was actually occurring. Several scientists presented preliminary research at the conference showing that chemical plastic additives (like phthalates and Bisphenol A) and PCBs that stick to plastics are present in the tissues of animals that have ingested plastic materials. Potential hormone system disruption is also of concern. Pretty scary stuff. But, at least we were learning about it in blissful, tropical Hawaii. How did the conference location influence your experience? 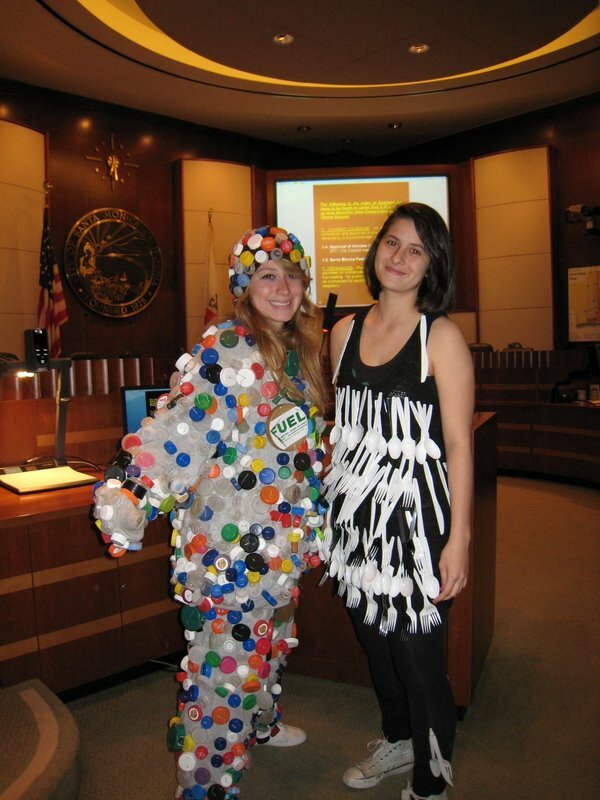 Samohi's Team Marine led fight to ban bags. The Santa Monica City Council unanimously approved an ordinance Tuesday night that bans single use plastic and paper bags, but allows retailers to sell “green” paper bags for at least a dime. Due to the passage of Proposition 26 with its chilling impact on government’s ability to create and raise fees, Santa Monica abandoned its original ordinance, which would have put the paper-bag fee at a quarter with some of the revenue coming back to the city. Instead, leaders opted to model their bill after L.A. County’s recently approved ban. Fifty people came out to support the bag ban ordinance, about 25 students with Santa Monica High School Team Marine teacher Ben Kay and 25 attendees from environmental groups and the general public. As you might have expected, the students stole the show. Dressed in costumes ranging from bag man to straw student to lid lady to bottle boy, the students came out during finals week to advocate for the bag ban. In a proud moment for me, my son Zack, an ocean swimmer and three year co-president of the Heal the Bay Surfrider Club, testified in support of the ordinance. Zack reminded council members that he started testifying to them as a freshman. Now he’s a graduating senior. Santa Monica is the undisputed greenest city in California (OK, Berkeley will dispute that). How did it take its leaders nearly four years to ban single use bags? If you guessed ongoing litigation threats from the Coalition to Save the Plastic Bag, then you’ve been paying attention. In an interesting twist, Los Angeles County is the new statewide leader on breaking Californians’ 19-billion-a-year addiction to single-use shopping bags. The Board of Supervisors voted 3-1 today to ban plastic and paper bags in unincorporated areas of the county and allow grocery stores, drug stores and convenience stores to charge a dime for green paper bags. The ordinance is the farthest-reaching bag ban ordinance in California and should result in a 600 million-bag-a-year reduction in the county. Last weekend the Plastic Pollution Coalition hosted a TEDx event in Santa Monica on the Not So Great Pacific Garbage Patch. The gathering was well attended by celebrities (Jackson Browne, Ben Lear, Daphne Zuniga and Ed Begley Jr.), explorers (Dr. Sylvia Earle, Charlie Moore, Fabien Cousteau and David De Rothschild) and numerous other environmental leaders fighting against the scourge of plastic pollution. The well-produced evening beamed via webcast globally and included a blend of dramatic footage from plastic contaminated gyres (including a short film from the 5 Gyres expeditions from Marcus Ericsen and Anna Cummins), performances from Lear, Browne and others, and solutions-oriented talks from such Heal the Bay friends as Long Beach Vice Mayor Suja Lowenthal, Lisa Boyle and Leslie Tamminen. Attendees also saw the unveiling of an ad campaign from Leo Burnett that asks people to become citizens of the Crapola Islands (also known as the Pacific Garbage Patch) – the only nation we want to disappear. Two speakers presented potential solutions that won’t have a positive impact on the global marine debris crisis. Patrick Kenney of Green Harvest Technologies spoke about a green future with bioplastics. Although there are many eco-advantages to bioplastics, especially in areas with effective composting programs, solving the plastic pollution problems in our oceans is not one of them. New trash limits for S.M. Bay may make this depressing scene a thing of the past. The Los Angeles Regional Water Quality Control Board voted 4-1 Thursday to approve tough, new marine debris limits for Santa Monica Bay. 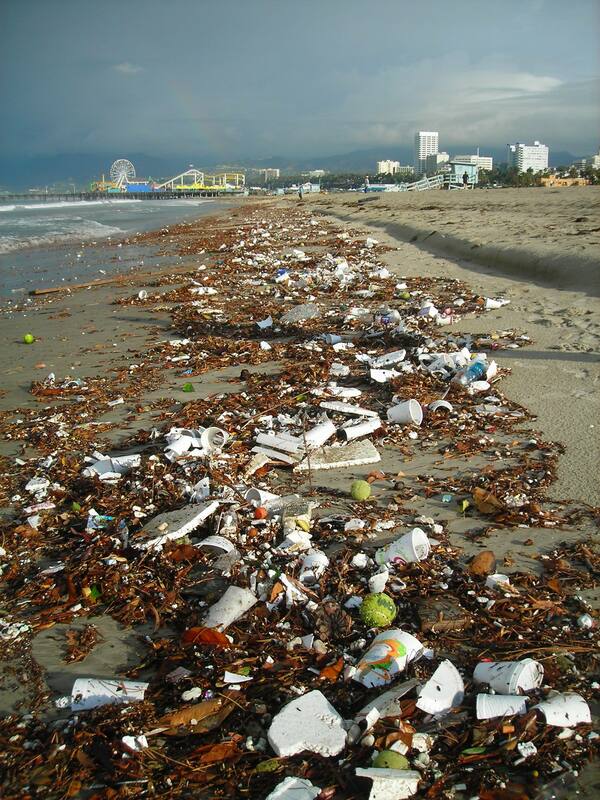 The limits, based on 11 similar trash Total Maximum Daily Loads in the Los Angeles region, give Santa Monica Bay watershed cities, Los Angeles County and land management agencies like State Parks, eight years to reduce the amount of trash going into the Bay to zero. Compliance can be met by installing full capture mechanisms like trash screens and inserts or other state-approved devices. All devices must be adequately designed, operated and maintained to meet state requirements. Full adherence is mandated within eight years. The action marks the last trash abatement measure required under the 1999 TMDL Consent Decree among Heal the Bay, the Santa Monica Baykeeper, the NRDC and the federal EPA. The vote truly marks a major water quality milestone. Congratulations to the Regional Water Board members for their groundbreaking leadership on trash abatement regulations.